the extents to the tablespaces. they are not returned after the sort, but remain available for other multiple sorts. truncate the table or cluster with a TRUNCATE…DROP STORAGE statement. segment size is computed, internal algorithms determine the size of each extent. users into consumer groups, with each group assigned a maximum undo space limit. Oracle Database 10g automatically tunes a parameter called the undo retention period. go below the value of the UNDO_RETENTION initialization parameter. Monitor transaction and undo information with V$TRANSACTION and V$ROLLSTAT. behaviors of the automatic undo management undo segments. Local management of extents automatically tracks adjacent free space, eliminating the need to coalesce free extents. The SYSTEM tablespace always contains the data dictionary tables for the entire database. The data dictionary tables are stored in datafile 1. PL/SQL Program Units Description All data stored on behalf of stored PL/SQL program units (that is, procedures, functions, packages, and triggers) resides in the SYSTEM tablespace. If the database contains many of these program units, then the database administrator must provide the space the units need in the SYSTEM tablespace. undo tablespace, the transaction binds to the system undo segment. let the system choose an available undo tablespace. tablespace with the ALTER TABLESPACE statement. When you create a tablespace, you choose one of these methods of space management. Later, you can change the management method with the DBMS_SPACE_ADMIN PL/SQL package. segment exists for every instance that performs a sort operation in a given tablespace. demands of all of the active sorts running on that instance. Tempfiles are always set to NOLOGGING mode. You cannot make a tempfile read only. You cannot create a tempfile with the ALTER DATABASE statement. BACKUP CONTROLFILE does not generate any information for tempfiles. CREATE CONTROLFILE cannot specify any information about tempfiles. When you create or resize tempfiles, they are not always guaranteed allocation of disk space for the file size specified. On certain file systems (for example, UNIX) disk blocks are allocated not at file creation or resizing, but before the blocks are accessed. necessary for database recovery; they were already written to the datafiles. and to resolve in-doubt distributed transactions. been run. This operation is a statement-level rollback. statement is a DDL statement, then the implicit commit that immediately preceded it is not undone. resumable semantics for the session using the ALTER SESSION statement. Oracle has generated undo information. The undo information contains the old data values changed by the SQL statements of the transaction. Oracle has generated redo log entries in the redo log buffer of the SGA. The redo log record contains the change to the data block and the change to the rollback block. These changes may go to disk before a transaction is committed. The changes have been made to the database buffers of the SGA. These changes may go to disk before a transaction is committed. The internal transaction table for the associated undo tablespace records that the transaction has committed, and the corresponding unique system change number (SCN) of the transaction is assigned and recorded in the table. Note: The data changes for a committed transaction, stored in the database buffers of the SGA, are not necessarily written immediately to the datafiles by the database writer (DBWn) background process. This writing takes place when it is most efficient for the database to do so. It can happen before the transaction commits or, alternatively, it can happen some time after the transaction commits. The log writer process (LGWR) writes redo log entries in the SGA’s redo log buffers to the redo log file. It also writes the transaction’s SCN to the redo log file. This atomic event constitutes the commit of the transaction. 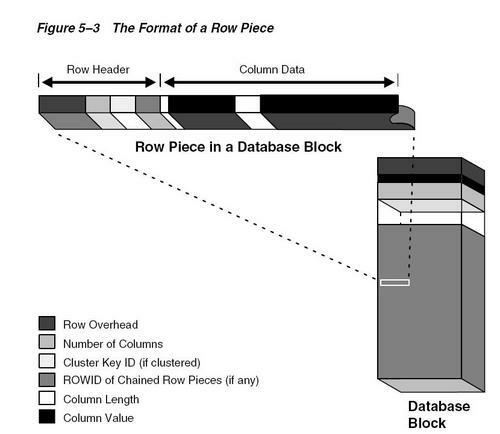 Oracle releases locks held on rows and tables. Oracle marks the transaction complete. Note The default behavior is for LGWR to write redo to the online redo log files synchronously and for transactions to wait for the redo to go to disk before returning a commit to the user. However, for lower transaction commit latency application developers can specify that redo be written asynchronously and that transactions do not need to wait for the redo to be on disk. You can name a transaction, using a simple and memorable text string. You can use transaction names to find a specific transaction in data dictionary views, such as V$TRANSACTION. Name a transaction using the SET TRANSACTION … NAME statement before you start the transaction. Transaction names do not have to be unique; different transactions can have the same transaction name at the same time by the same owner. Note In previous releases, you could associate a comment with a transaction by using a commit comment. In a future release, commit comments will be deprecated. and then return to the calling transaction’s context and continue with that transaction. main transaction and does not share any locks or resources with the main transaction. limits, on how many levels of autonomous transactions can be called. transaction does not undo the autonomous transaction. in more than one row piece, it is chained across multiple blocks. required to retrieve the rest of the row. space required to hold a value can grow and shrink with updates to the data. N.B. Each row also uses 2 bytes in the data block header’s row directory. rowid for the new values. rowids in SQL statements such as SELECT, UPDATE, and DELETE. the new column becomes the last column stored. then the benefits of placing frequently null columns last are lost. short reference to the symbol table. work on regular database blocks also work on compressed database blocks. example, historical data) is kept compressed. defined on the deptno column. temporary table, because each session has its own private data. DML statements on temporary tables do not generate redo logs for the data changes. during a session or instance failure. reduced memory use associated with shared SQL when you use views. Chapter 18, "Partitioned Tables and Indexes"
Views that are not updatable can be modified using INSTEAD OF triggers. They must be refreshed when the data in their master tables changes. They improve the performance of SQL execution when they are used for query rewrites. Their existence is transparent to SQL applications and users. Unlike indexes, materialized views can be accessed directly using a SELECT statement. Depending on the types of refresh that are required, they can also be accessed directly in an INSERT, UPDATE, or DELETE statement. A materialized view can be partitioned. You can define a materialized view on a partitioned table and one or more indexes on the materialized view. Oracle maintains the data in materialized views by refreshing them after changes are made to their master tables. The refresh method can be incremental (fast refresh) or complete. For materialized views that use the fast refresh method, a materialized view log or direct loader log keeps a record of changes to the master tables. Materialized views can be refreshed either on demand or at regular time intervals. Alternatively, materialized views in the same database as their master tables can be refreshed whenever a transaction commits its changes to the master tables. definitions are always available, because the SYSTEM tablespace is always online. Oracle also provides support for function-based indexes and domain indexes specific to an application or cartridge. Oracle recommends that unique indexes be created explicitly, using CREATE UNIQUE INDEX. Creating unique indexes through a primary key or unique constraint is not guaranteed to create a new index, and the index they create is not guaranteed to be a unique index. DEFINITION: A composite index (also called a concatenated index) is an index that you create on multiple columns in a table. DEFINITION: Indexes and Keys, although the terms are often used interchangeably, indexes and keys are different. Indexes are structures actually stored in the database, which users create, alter, and drop using SQL statements. You create an index to provide a fast access path to table data. Keys are strictly a logical concept. Keys correspond to another feature of Oracle called integrity constraints, which enforce the business rules of a database. Because Oracle uses indexes to enforce some integrity constraints, the terms key and index are often are used interchangeably. However, do not confuse them with each other. N.B A key value cannot exceed roughly half (minus some overhead) the available data space in a data block. NULL values in indexes are considered to be distinct except when all the non-NULL values in two or more rows of an index are identical, in which case the rows are considered to be identical. Therefore, UNIQUE indexes prevent rows containing NULL values from being treated as identical. This does not apply if there are no non-NULL values—in other words, if the rows are entirely NULL. Oracle does not index table rows in which all key columns are NULL, except in the case of bitmap indexes or when the cluster key column value is NULL. The expression cannot contain any aggregate functions, and it must be DETERMINISTIC. Function-based indexes provide an efficient mechanism for evaluating statements that contain functions in their WHERE clauses. The value of the expression is computed and stored in the index. When it processes INSERT and UPDATE statements, however,Oracle must still evaluate the function to process the statement. The table must be analyzed after the index is created. The query must be guaranteed not to need any NULL values from the indexed expression, because NULL values are not stored in indexes. The index is marked as DISABLED. Queries on a DISABLED index fail if the optimizer chooses to use the index. 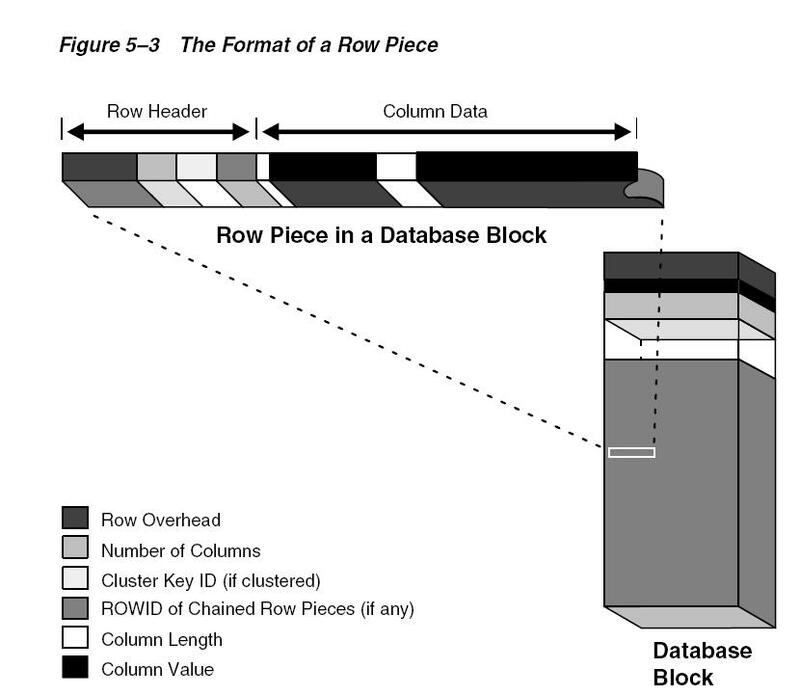 Space available for index data is the Oracle block size minus block overhead, entry overhead, rowid, and one length byte for each value indexed. When you create an index, Oracle fetches and sorts the columns to be indexed and stores the rowid along with the index value for each row. Then Oracle loads the index from the bottom up. Oracle uses B-trees to store indexes to speed up data access. With no indexes, you have to do a sequential scan on the data to find a value. For n rows, the average number of rows searched is n/2. This does not scale very well as data volumes increase. Consider an ordered list of the values divided into block-wide ranges (leaf blocks). The end points of the ranges along with pointers to the blocks can be stored in a search tree and a value in log(n) time for n entries could be found. This is the basic principle behind Oracle indexes. 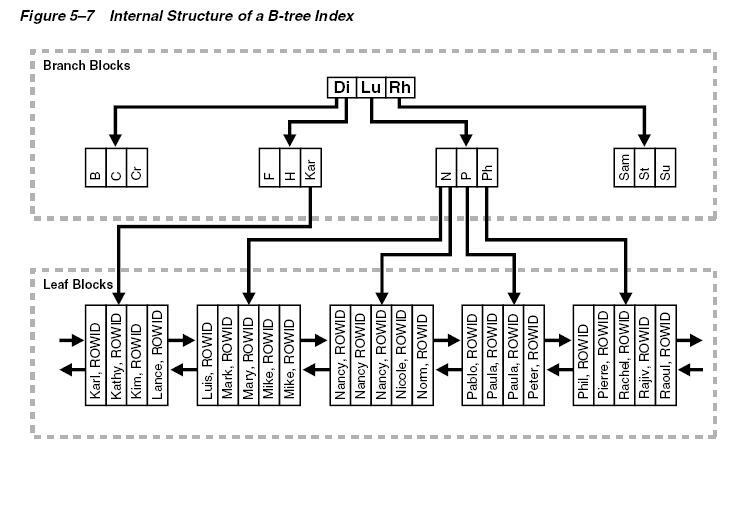 The upper blocks (branch blocks) of a B-tree index contain index data that points to lower-level index blocks. The lowest level index blocks (leaf blocks) contain every indexed data value and a corresponding rowid used to locate the actual row. The leaf blocks are doubly linked. Indexes in columns containing character data are based on the binary values of the characters in the database character set. For a unique index, one rowid exists for each data value. For a nonunique index, the rowid is included in the key in sorted order, so nonunique indexes are sorted by the index key and rowid. Key values containing all nulls are not indexed, except for cluster indexes. Two rows can both contain all nulls without violating a unique index. If the blocks have n keys then they have n+1 pointers. The number of keys and pointers is limited by the block size. All key and ROWID pairs are linked to their left and right siblings. They are sorted by (key, ROWID). All leaf blocks of the tree are at the same depth, so retrieval of any record from anywhere in the index takes approximately the same amount of time. B-tree indexes automatically stay balanced. All blocks of the B-tree are three-quarters full on the average. B-trees provide excellent retrieval performance for a wide range of queries, including exact match and range searches. Inserts, updates, and deletes are efficient, maintaining key order for fast retrieval. B-tree performance is good for both small and large tables and does not degrade as the size of a table grows. Index unique scan is one of the most efficient ways of accessing data. This access method is used for returning the data from B-tree indexes. The optimizer chooses a unique scan when all columns of a unique (B-tree) index are specified with equality conditions. Index range scan is a common operation for accessing selective data. It can be bounded (bounded on both sides) or unbounded (on one or both sides). Data is returned in the ascending order of index columns. Multiple rows with identical values are sorted (in ascending order) by the ROWIDs. Creating a reverse key index, compared to a standard index, reverses the bytes of each column indexed (except the rowid) while keeping the column order. Such an arrangement can help avoid performance degradation with Real Application Clusters where modifications to the index are concentrated on a small set of leaf blocks. By reversing the keys of the index, the insertions become distributed across all leaf keys in the index. N.B. Using the reverse key arrangement eliminates the ability to run an index range scanning query on the index. Only fetch-by-key or full-index (table) scans can be performed. In a bitmap index, a bitmap for each key value is used instead of a list of rowids. Each bit in the bitmap corresponds to a possible rowid. If the bit is set, then it means that the row with the corresponding rowid contains the key value. A mapping function converts the bit position to an actual rowid, so the bitmap index provides the same functionality as a regular index even though it uses a different representation internally. If the number of different key values is small, then bitmap indexes are very space efficient. Bitmap indexing efficiently merges indexes that correspond to several conditions in a WHERE clause. Rows that satisfy some, but not all, conditions are filtered out before the table itself is accessed. This improves response time, often dramatically. Fully indexing a large table with a traditional B-tree index can be prohibitively expensive in terms of space, because the index can be several times larger than the data in the table. Bitmap indexes are typically only a fraction of the size of the indexed data in the table. Bitmap indexes are also not suitable for columns that are primarily queried with less than or greater than comparisons. Bitmapped indexes are only useful with equality queries, especially in combination with AND, OR, and NOT operators. Table 5–1 shows a portion of a company’s customer data. MARITAL_STATUS, REGION, GENDER, and INCOME_LEVEL are all low-cardinality columns. There are only three possible values for marital status and region, two possible values for gender, and four for income level. Therefore, it is appropriate to create bitmap indexes on these columns. A bitmap index should not be created on CUSTOMER# because this is a high-cardinality column. Instead, use a unique B-tree index on this column to provide the most efficient representation ad retrieval. Each entry or bit in the bitmap corresponds to a single row of the CUSTOMER table. The value of each bit depends upon the Values of the corresponding row in the table. For instance, the bitmap REGION=’east’ contains a one as its first bit. This is because the region is east in the first row of the CUSTOMER table. The bitmap REGION=’east’ has a zero for its other bits because none of the other rows of the table contain east as their value for REGION. Bitmap indexes can process this query with great efficiency by counting the number of ones in the resulting bitmap, as illustrated in Figure 5–8. To identify the specific customers who satisfy the criteria, the resulting bitmap can be used to access the table.